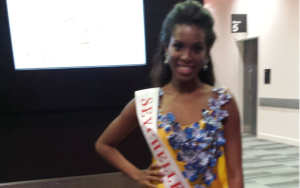 Miss Seychelles 2014, Camila Estico proudly represented the Seychelles islands at the 64th edition of Miss World 2014, held last night in London, UK. The coveted title was won by Miss South Africa, Rolene Strauss who was crowned on stage by Miss World 2013 Megan Young. The top three places, which were announced in reverse order, also saw Miss Hungary Edina Kulcsar being named as runner-up and Miss USA Elizabeth Safrit in third place. This year saw 125 contestants vying for the iconic title, from countries all around the globe. They battled it out in categories such as Miss World Top Model, Beach Fashion, Multimedia, Talent and Sports and Fitness. The other 10 contestants who made it to the final 10 were Miss Australia, Miss England, Miss Guyana, Miss Brazil, Miss Kenya, Miss Mexico and Miss India. The People’s Choice award went to Miss Thailand, Nonthawan Thongleng. A proud and confident Camila braced the stage in an elegant yellow dress designed by Karine from Kankan and said later on that she was so prepared for the final event, after rehearsing for three weeks. She felt that being at Miss World 2014 and going through the preparations leading on to the event, has shaped her and made her grow in so many ways. She was happy to be part of this event and said it was like being part of a big ‘happy family’. Attending the Miss World final to support Miss Seychelles were Camila’s mother and little sister, a team from the Seychelles Tourism Board led by Deputy CEO Nathalie Didon as well as the Seychelles High Commissioner in London, Marie-Pierre Lloyd.